Lime is an important soil conditioner for your lawn. Some people treat lime like a silver bullet or a fertilizer and apply it every year. It's not either of those and usually doesn't need to be applied every year. If your soil has a low pH (acidic) lime can seem like a miracle cure. The reason is the pH of your soil can affect so many different things and correcting your soil pH can have dramatic benefits. Cool season grasses do better in a neutral pH so if you're soil is acidic you're grass won't grow as thick. Thin grass looks bad and doesn't help to crowd out weeds. Many weeds don't mind acidic soil so they'll have no problem growing where your grass won't. Lime also provides calcium to the soil. If you're soil lacks calcium, it could lead to more dandelions since dandelions have an easier time reaching down into the soil to extract calcium. A proper ratio of calcium to magnesium is also important in clay soils, which cover most of the northeast region. According to SafeLawns.org, the proper ratio should be 7 parts calcium to 1 part magnesium. Too much magnesium can also lead to soil compaction in clay soils. Proper pH also makes it easier for your lawn to absorb the nitrogen available in the soil. Maybe that's why people think it's a fertilizer? After a lime treatment to an acidic soil your lawn will be able to get at the nitrogen it couldn't before which will make it green up. Some lawn diseases such as brown patch also do better in acidic soils. Moss can also be a problem in acidic soils that are poor draining, compacted and get little sun. All things that adding lime can counteract. Once you get your soil to the right pH you will see dramatic results if you had acidic soil so it's understandable that people might want to use it every year. But if your soil is already at a good pH then all it will do is add calcium. You should check your soil's pH every year before you decide to apply lime. There are affordable ways to test soil pH but you need to follow directions carefully. A test from your local Cooperative Extension Office will be more accurate. It's a good idea to get a soil test every few years to compare against your own tests. Once your soil is at a proper pH, you shouldn't need to add lime for a few years if you're using an organic program. Synthetic fertilizers tend to make the soil more acidic faster. The picture on the right shows the transformation of a section of lawn that was in very acidic soil. It is in a troublesome area that gets little sun and water which resulted in moss growth and discolored grass. The grass was only planted a couple of years before the first photo was taken. The blades were long, bent over and matted. Fertilizers didn't seem to do much for it. The pH is still a bit too low but I didn't want to apply too much Encap Fast Acting Lime all at once. Especially because of the claims from Encap that 30lbs covers 5,000 square feet. The area was overseeded but the new seeds hadn't germinated when the photo was taken. The Encap Fast Acting Lime definitely helped. Encap Fast Acting Lime is not a hydrated lime also known as slaked lime. Hydrated lime also acts quickly but is completely different. Hydrated lime is calcium hydroxide while Encap Fast Acting Lime is made of calcium carbonate which is what is normal, pelletized lime. It won't risk burning your lawn the way hydrated lime might. The reason that Encap Fast Acting Lime works so fast is because it is ground very fine and has a higher percentage of calcium carbonate compared to other types of lime. The calcium carbonate is ground very fine and then a binding agent is used to group it together to make it easier to spread. When it gets watered in it starts to dissolve and break down into the small particles. The small particles work faster. Think of the difference between using granulated vs cube sugar in your coffee. It also uses two of Encap's technologies, AST and MCT. AST is Encap's Advanced Soil Technology which helps the applied product integrate with the soil. MCT is Movement Control Technology. It helps keep the lime where you applied it so it doesn't wash away. I consider this product to be somewhere between using a traditional pelletized lime and the liquid limes. Liquid limes are very expensive. They raise the pH of the soil very quickly but the effects don't last long. Regular lime can last for a long time but it may also take 6-12 months to see significant changes. It seems that Encap found a way to bind the small size of calcium carbonate used in liquid lime so that it can be used in dry form and it won't blow away or run off. They say you don't need to use as much. I think it's because it goes to work so quickly. When you apply regular lime, it works slowly, so that 50lbs/1,000 sq ft will work a little at a time over a couple of years while the Encap product will be more effective, but may need to be reapplied sooner. Just not as soon as liquid lime. At least that's my impression. The claim that Encap Fast Acting Lime can be applied at 30lbs/5,000 sq ft (6lbs/1,000 sq ft) for similar results seems a bit too optimistic to raise the soil pH by 1 point. At least with clay soils. Clay soils require a higher application of lime than sandy soils so in the northeast you'll likely need more. I applied a little more than 10lbs/1,000 sq ft last year and my pH only came up about 1/2 a point. The composition of your soil may require you to use more or less. I'll likely use it again because it did seem to work fast in my case. I had one area that was mossy, compacted and poor draining. The grass blades were matted and virtually colorless. This year that same area is much thicker and greener. The blades of grass are standing straight up too. If your soil requires a lot of lime, Encap recommends applying a double application (12lbs/1,000 sq ft) for your first application and then a regular application every 9 or more weeks until you apply the required amount. 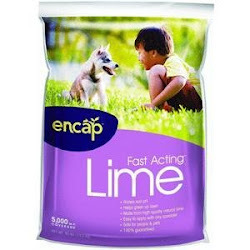 Encap's Fast Acting Lime I believe is also sold under different brand names such as Pennington Fast Acting Lime. If you see something called "Fast Acting Lime" that comes in a 30lb bag, it's a good bet it's made by Encap, just re-branded. Here's a good review of someone using Encap Fast Acting Lime to grow mushrooms with good results. Encap Fast Acting Lime is more expensive than pelletized lime but it has the benefit of working fast and is cheaper than liquid lime. If you have a large area and it seems like a lot of money, it could be a good idea to use a combination of Fast Acting Lime and regular pelletized lime so you can see results sooner. I couldn't find Fast Acting Lime locally and wound up having to order it online. Shipping is a bit high but if you get 2 bags it's more reasonable. What type of soil does your lawn have? 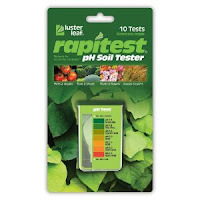 Did you do a soil testing to know your pH before and after application? How much rain or irrigation did your lawn get exposed to after application? The lawn area in the photo is a heavy clay. I used the Rapitest pH kit. It was about 5 before (maybe lower) and 5.5 this year. Those tests aren't dead accurate but based on the symptoms, I could tell that the pH was way off. Now that it's getting closer to normal, I will send samples to the lab for a proper pH test to determine how much more it needs. After application I watered it in, but after that it just got whatever rain hit it for the most part minus a few irregular waterings. That area has a lot going against it that causes it to not get much supplemental water. It is very shady. Only gets filtered light through some trees. I don't fertilize it as much because of that, and it also doesn't need as much water with less fertilizer. It was very compacted. Worst of all... to get to that area with a hose is a pain. Except for the summer though, it seems to get enough. There's a downspout nearby and I've been toying with the idea of putting a rain barrel, pump and low flow pop up sprinklers with something like the Hunter MP Rotators or Rain Bird Rotary Nozzles but that's not likely to happen this year. How are things 2 years later? Hi, sorry I didn't see your comment earlier. Two years later that area is still looking good and I haven't added any more lime to it but I need to check it again. The before photo really doesn't do it justice how bad the lawn actually looked. The blades of grass looked white and they were laying over on their side in swirls. Now the lawn is green and stands upright and there's no more moss. In addition to liming the lawn I also aerated with a Turf Hound core areator. That area gets very little sun and I need to reseed it every year but I forgot last year. There are some thin areas underneath the bushes but other than that it looks good. I have been using the Encap Fast Acting Lime every year, and it works great! My neighbors are all jealous of my lawn!